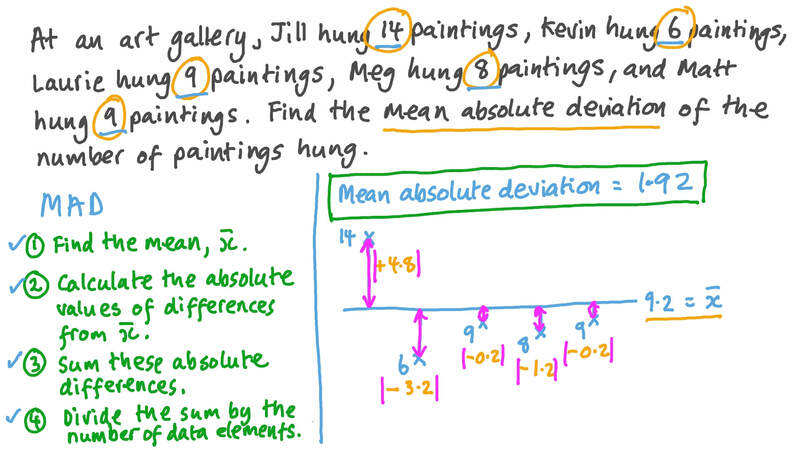 In this lesson, we will learn how to find and interpret the mean absolute deviation. A Data set 𝐴 has a mean of = 1 7 , data set 𝐵 has a mean of = 1 4 , and both sets have a MAD of 9. B Data set 𝐴 has a mean of = 1 2 , data set 𝐵 has a mean of = 1 6 , and both sets have a MAD of 9. C Data set 𝐴 has a mean of = 1 2 , data set 𝐵 has a mean of = 9 , and both sets have a MAD of 2. D Data set 𝐴 has a mean of = 1 0 , data set 𝐵 has a mean of = 1 6 , and both sets have a MAD of 6. E Data set 𝐴 has a mean of = 1 2 , data set 𝐵 has a mean of = 1 6 , and both sets have a MAD of 8.